Through cinematic recreations of historical combat, many anti-war movies are able to evoke the devastation and dangers of war, shedding light on the horrible realities soldiers face on both sides of the battlefield. But in Andrew Niccol's 'Good Kill,' our protagonists never come face to face with harrowing beach invasions or desert ambushes. In fact, they never even place their boots on the ground. Instead, they manage to engage the enemy from thousands of miles away, nestled safely within the confines of a Nevada military base. An atypical anti-war film marked by strong character work, the movie manages to overcome a preachy political slant, resulting in a gripping psychological examination of 21st century warfare waged from 10,000 feet above the ground. Major Thomas Egan (Ethan Hawke) is a skilled military pilot who conducts unmanned drone strikes on Taliban targets, allowing him to eliminate terrorists from a secure Las Vegas Air Force facility. But when the CIA begins assigning missions with a high risk of collateral damage, Egan starts to question the ethics of his actions. As the realities of his job eat away at his conscience, the man begins to unravel, placing his professional and personal life in jeopardy. From the get go, director Andrew Niccol does a great job of highlighting the intricacies of drone warfare, playing up the almost science fiction-esque aspects of the procedure. When we first encounter a mission, the filmmakers use carefully composed close-ups of Egan cut with POV shots of his targets, making it seem as if the character is actually in the cockpit of the plane. It's only after the target is eliminated, that we suddenly cut to a wider shot, revealing that the Major is really safely positioned thousands of miles away from the battlefield in front of a console with monitors and a joystick. This initial sequence immediately establishes the disconnect that exists between drone strikes and traditional warfare -- a visual and dramatic juxtaposition that will go on to fuel much of the runtime. To this end, we spend a large chunk of the movie locked away in the dimly lit "sweatbox" where the pilots conduct their missions, transitioning between a digital bird's-eye view of their exploding targets, and an intimate peek at the team securely stationed behind their videogame-like controls. Niccol also engenders a certain voyeuristic quality in these scenes, emphasizing the drones' level of clandestine surveillance over their subjects. Through the director's lens, the military becomes an almost god-like figure, able to watch the world from above while doling out deadly judgement as it sees fit through the simple press of a button. With that said, this danger-free trigger pulling proves to be far less simple than it first appears, leading to an engaging character study that examines the moral toll of long-distance termination -- especially when the risk for collateral damage begins to increase. For his part, Ethan Hawke turns in a strong performance, conveying all of Egan's conflicted emotions well. Torn up by the stress and consequences of his orders, the man essentially has a breakdown, leading to some genuinely affecting moments, including a particularly powerful confession between Egan and his wife (January Jones). Likewise, this internal struggle helps to enhance the drama during the drone strike sequences, creating a palpable sense of on-screen tension. Sadly, as gripping as most of the film can be, Niccol's approach is not without some flaws, especially when it comes to how he chooses to convey his political message. In the included special features, the director talks about how his goal was to let audiences come to their own conclusions about drone strikes, but the script is far too didactic and preachy to allow for such ambiguity. Instead, the filmmaker's negative stance on the issue is overwhelmingly clear, leading to some unrealistic discussions between characters that basically turn them into mouthpieces for the director's opinions. Likewise, the CIA's depiction is almost comically nefarious, relegating Langley to nothing more than a disembodied creepy voice with a nonchalant disregard for innocent life. Now, I'm not really criticizing Niccol for wanting to inject his own concerns about drone strikes into the script (or even disagreeing with them), but there are times when a more restrained and balanced approach would have actually helped his cause. While some of the potentially beneficial aspects of drone warfare are briefly addressed, this side of the argument is essentially ignored. By simply showing us the realities of the drone strike process without the unnecessary preaching, the filmmakers could have let the positive and negative aspects speak for themselves. Unfortunately, far too often the movie's lack of subtlety ends up diluting its impact. Though proponents of drones are unlikely to be swayed by the director's approach, the argument is still conveyed through engaging filmmaking and a strong performance from Ethan Hawke, resulting in a powerful anti-war film that is able to address the unique horrors of 21st century combat. Despite its occasionally heavy-handed tone, 'Good Kill' does successfully address some rather thought-provoking questions about how we choose to engage our enemies -- exposing the inherent paradox of its title with disturbing precision. 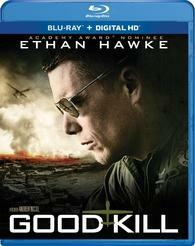 Paramount brings 'Good Kill' to Blu-ray on a single BD-50 disc that comes housed inside a keepcase. A separate DVD and instructions for an iTunes/UltraViolet Digital HD copy are also included. After some skippable trailers, the disc transitions to a traditional menu screen. The movie is provided with a 1080p/AVC MPEG-4 transfer in the 2.35:1 aspect ratio. Sharp and free from any major technical issues, this is a strong video presentation. Shot on the Arri Alexa XT, the digital source is clean and crisp with no egregious artifacts or noise. With that said, the drone POV footage does feature an intentionally compressed appearance in order to replicate the look of the cameras used on the planes. Overall clarity is sharp with nice fine details, exposing every morally conflicted crease on Ethan Hawke's world-weary brow. The color palette adheres to slightly desaturated style with a cool cast in the drone control room scenes and a faintly teal/orange push in some outdoor sequences. A brief trip to the Vegas strip does offer some pleasing pop, however, and the glittering lights sparkle off the screen nicely. Contrast is balanced well and black levels are deep and consistent. The movie's undersaturated aesthetic doesn't lead to a conventionally impressive appearance, but detail is rendered well and the chosen style suits the material. The film is presented with an English DTS-HD MA 5.1 track along with English, English SDH, French and Spanish subtitles. With its subtle design work, this is a restrained yet effective mix. Dialogue is clear and well prioritized throughout. The overall soundstage is fairly reserved with minimal surround usage, but appropriate atmospherics are spread delicately around the room. Choppers in the distance and other general military base effects occasionally hit the rears, along with general nature ambiance (birds, thunder) and some requisite slot machines during the Vegas casino scene. Since this is a rather atypical war film, there are no real explosions or shootouts to be found, but the track does offer some thumping low frequencies in a few music selections. Dynamic range is wide without distortion and all of the elements are balanced well. 'Good Kill' doesn't really feature any standout sequences from an audio standpoint, and the soundscape can feel a tad small at times, but the mix gets the job done without any notable issues. Good Kill: Behind the Scenes (HD, 15 min) – Presented in 1080p with Dolby Digital 2.0 audio, this featurette offers cast & crew interviews along with on-set footage. The participants discuss the realities of drone warfare, the characters, and casting. Though not packed with info, this is a solid inclusion. 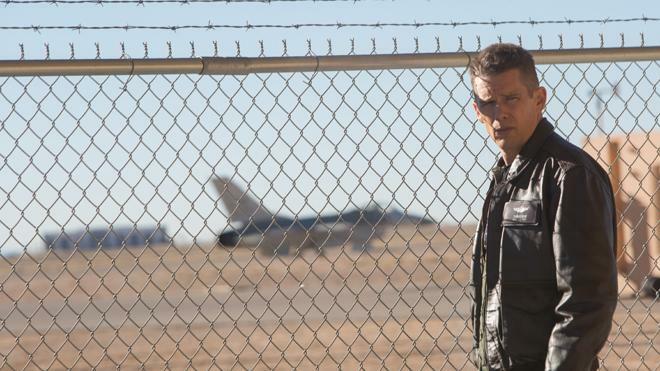 Andrew Niccol's 'Good Kill' presents a harrowing and critical look at 21st century warfare. Though the film can become overwhelmingly didactic at times, the character work is strong, and the movie's central questions are thought-provoking. On the technical front, the video transfer is great and the audio mix is solid. We only get one brief supplement, but the included featurette provides some decent insights. While the movie's particular stance on drone strikes might not sit well with some viewers, the film's examination of the psychological effects of war remains powerful and affecting. Worth a look.